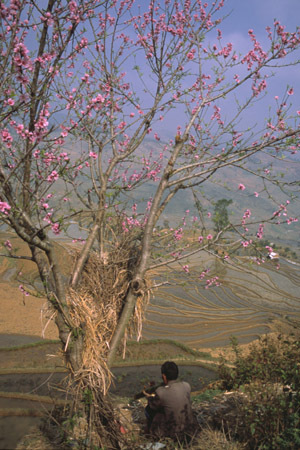 A farmer is seating beneath a peach tree in full bloom, smoking his bamboo pipe. Located in southern YunNan province, the Redriver county is very remote, rugged and landlocked, and very difficult to access. The rice terraces sculptured on mountains since generations back in time are magnificent, forming a unique landscape for the region. In late February spring is already arrived.